There's an adage that says when circumstances suddenly change and the dominoes start to fall, many of us are only two pay cheques away from homelessness. Rosemary Jenkinson's new play May The Road Rise Up puts flesh on the saying and follows the ups and downs of Mia, a Tesco delivery driver who loses her health, her partner, her home, and along the way her respect for government schemes that put points above need. 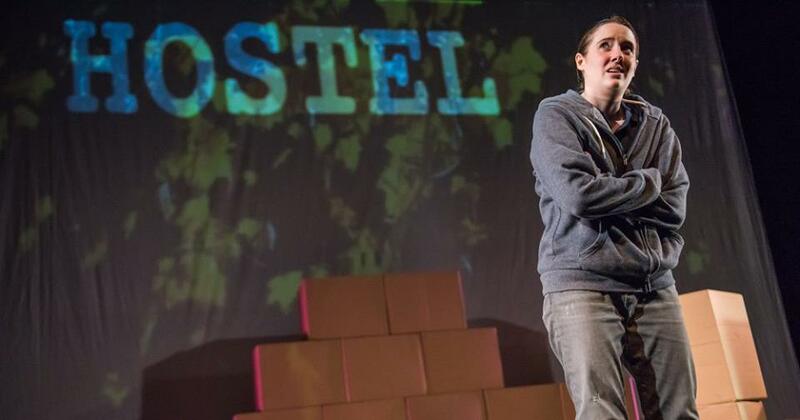 C21 Theatre Company's production is one of four one-handed shows being performed in Belfast theatres this week, a tangible sign of the budget pressures that theatre producers are operating under. While a reduction in on-stage talent can be constraining, it can also be liberating. 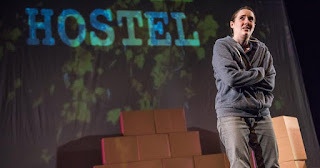 One man shows offer the opportunity for seamless shifting between characters with an actor challenged to convince the audience of each transformation through gestures, stance and accent. Christine Clare plays happy-go-lucky Mia. Dashcam footage is projected on the simple backdrop as she narrates her route delivering food and (mostly) drink to Belfast addresses. It's a stream of consciousness, at times like a list being recited, with commentary and reflections on what is happening around her. The flexible backdrop was probably at its most effective when it delivered visual gags in some early scenes: a shame that later scenes weren't enhanced with this technique. "I fed the 5,000 …"
Humour never deserts Mia even when her beloved Ryan (an out of work law graduate whose occupation is filling in application forms) leaves and her back pain means she can no longer drive. No matter her circumstance, Mia is never short of a friend and she continues to party with her mate Paddy (cue a parody outbreak of Queen with house anthem "I want to take E"). The carefully-judged plot balances the spiralling circumstances that pull Mia down with her attempt to keep a positive attitude and find solutions. If anything her expressions of hope prevent the play from descending into abject misery. A wall of brown cardboard boxes is slowly pulled apart, a visual metaphor for Mia's predicament. 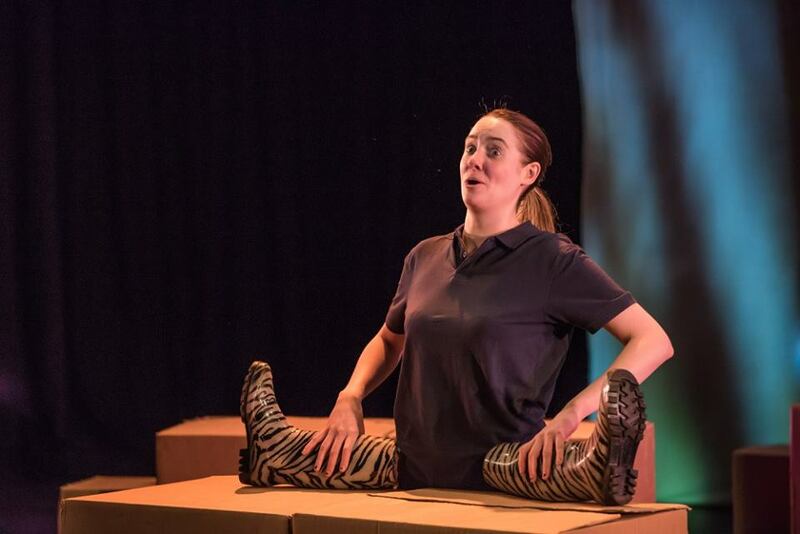 Jenkinson described her own experience of pain not being recognised in work capacity assessments for benefits in an interview with me to preview this production. "One sneeze and his eye would be out his earhole." Mia shifts from delivering food to relying on a food bank. Then her bed is swapped for a sofa and ultimately a cardboard box. Her fellow street friends are vibrant characters full of human kindness and witty repartee. While a positive influence is acknowledged, Jenkinson doesn't hold back in her criticism of some hostel staff and church groups who work with the homeless. When held up to the light, imperfections are found in every system that is supposed to support rather than obstruct. Clare is confident in her delivery of the myriad of lines that are full of Belfastisms and street-speak. Director Stephen Kelly and movement director Gary Rowntree have created a strong library of mannerisms to accompany the different stages of Mia's quandary, and some imaginative use of the limited props. The hour long performance finishes with a call to "rise up". While individual stories sometimes break through into news programmes or the inside pages of a newspaper, the arts are another effective way of highlighting how the systems and people charged with protecting and supporting the most vulnerable can end up doing the very opposite. 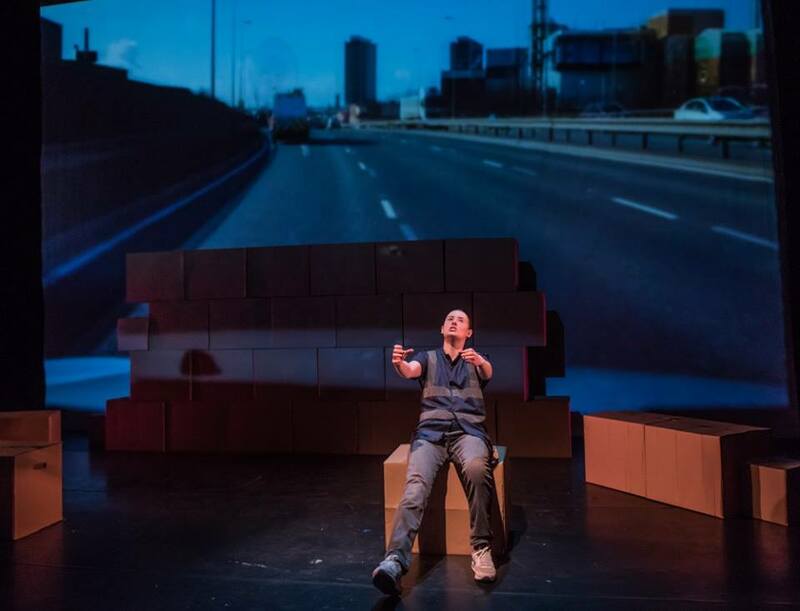 May The Road Rise Up follows on from last year's production of Entitled by MACHA in tackling the deficiencies within the benefits system. Mia is a likeable, though clearly flawed, character that is rarely larger than life. That realism has the consequence of dampening some of the potential dramatic effect. While it may not move you to tears, the play will educate and inform, and you'll leave the theatre wondering why these systemic policy failures continue to be supported by society. The question of what to do next after being on this journey of empathy is left as homework for the audience. May The Rose Rise Up finishes its run in the Lyric Theatre on Saturday 24 February before jump into Mia's delivery van and touring through Marketplace Theatre, Armagh (Thursday 1 March), Sean Holywood Arts Centre, Newry (Friday 2), The Strand Arts Centre, Belfast (Thursday 8), The Courtyard Theatre, Newtownabbey (Friday 9), Island Arts Centre, Lisburn (Saturday 10), The Alley Theatre, Strabane (Thursday 19 April) and Down Arts Centre, Downpatrick (Friday 20). Kabosh Theatre have another Rosemary Jenkinson play out on the road, with a revival of Lives in Translation (which premièred at the Belfast International Arts Festival) and are touring it through Tallaght (Tuesday 27 and Wednesday 28 February), Drogheda (Thursday 1 March), Ballymum (Friday 2) ,Galway (Sunday 4), Lyric Theatre Belfast (Wednesday 7), Dundalk (Thursday 8), Armagh (Friday 9), Derry (Saturday 10) and Limavady (Tuesday 13).